The BA-1567/U replacement battery by SAFT is designed to provide lasting power and reliability. The BA-1567/U is made from the ground-up with first-rate materials. Equaling or exceeding the original manufacturer's specifications for your equipment at an affordable price is a hallmark of SAFT. 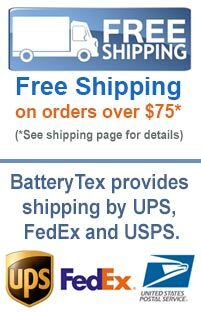 Thank you for making BatteryTex your provider of replacement batteries at everyday low prices. With thousands of batteries to choose from and extremely low prices you'll see why BatteryTex is your one-stop-shop for replacement batteries. BatteryTex (M-Tronics) is a family-owned battery supplier since 1977. Give us a call with any questions or for information on bulk discounts - 1-888-825-6661. Need other Night Vision Goggles batteries? Browse our complete stock here. Check out more great items for SAFT products. Batteries today aren't like they used be. From power to reliability and durability, today's batteries are far better than ever before. If you want information on the manufacturer warranty please reach out to us with the specific battery you're interested in. Standard warranties are for one-year however.